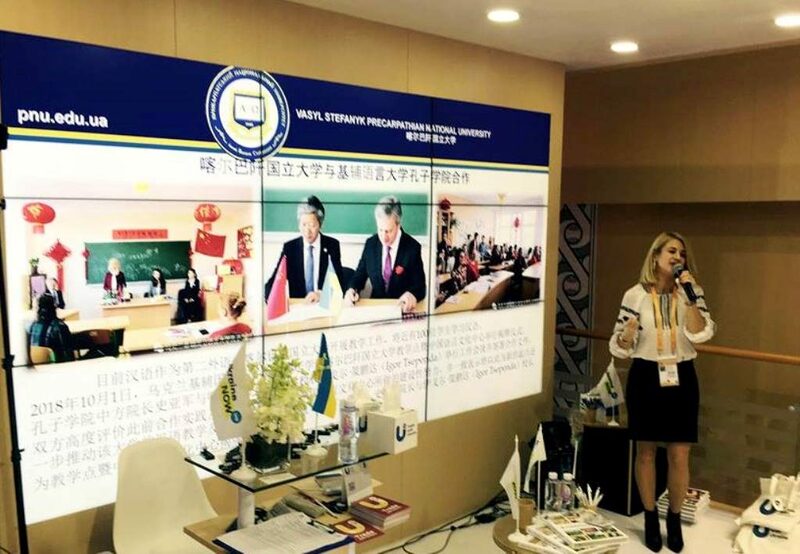 Recently Precarpathian Vasyl Stefanyk National University was showcased at the “China International Import Expo 2018” in Shanghai within the official program of the National stand for higher education quality workshop. The university was presented by the representative of the Ukrainian delegation, professor of Chinese from the department of general and Germanic linguistics, Iryna Iliychuk. The international expo was initiated by the general secretary of the Communist Party of China, president of the People’s Republic of China, Xi Jinping. The organizers of the event were the Ministry of Commerce of PRC and Shanghai local government with the support of the World Trade Organization and United Nations Industrial Development Organization. Our university took part in the Expo thanks to their partnership with the Ukrainian Institute for International Education. At this large-scale event, targeted at increasing import of various products and services to China, Precarpathian university showcased their higher education services. The opening ceremony of the Ukrainian National Stand was attended by the First Vice Prime Minister Stepan Kubiv, Managing Director for SME Finance at the European Bank for Reconstruction and Development Claudio Viezzoli, Ukraine’s Ambassador to China Oleh Dyomin, and Ukraine’s Consul General in Shanghai Dmytro Ponomarenko. Invited by the Ukrainian Institute of International Education, the event was attended by Gansu province delegation consisting of the department of education, culture and international relations representatives. During the presentation of our university, a lot of attention was paid to the international educational and scientific activity. Namely, to the development of Chinese studies, participation in projects and grants. Currently more than 70 students study Chinese as their second language. During the Expo, we conducted workshops on the level and conditions of obtaining higher education in Ukraine and provided information leaflets. The university representative Iryna Iliychuk had a meeting with the local authorities of Fuzhou, where she discussed the intentions of bilateral cooperation. During the auction Iryna Iliychuk presented the international project on the renovation of the astronomical observatory in the Carpathians, which is implemented by the Precarpathian University in cooperation with University of Warsaw. The organizers and participants of the international Expo said that such events open up new opportunities to deepen cooperation, as well as to implement new projects and initiatives in the sphere of education. The Ukrainian school will be successful if it is joined by successful teachers.